Engage with readers on your site by adding an easy to use comment tool! Be at ease while managing comments on your site. Access Control — Specify each user groups what they can do when commenting on your site. 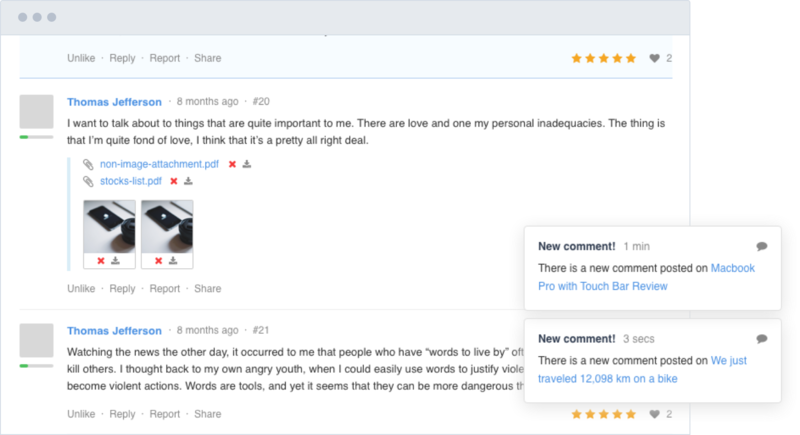 Like it or Pin it — You can now pin or give a thumbs-up outstanding comments on your article post. Category Specific Comments — Site moderators have the freedom to choose which particular categories on their Joomla website to have Komento enabled and start receiving comments. 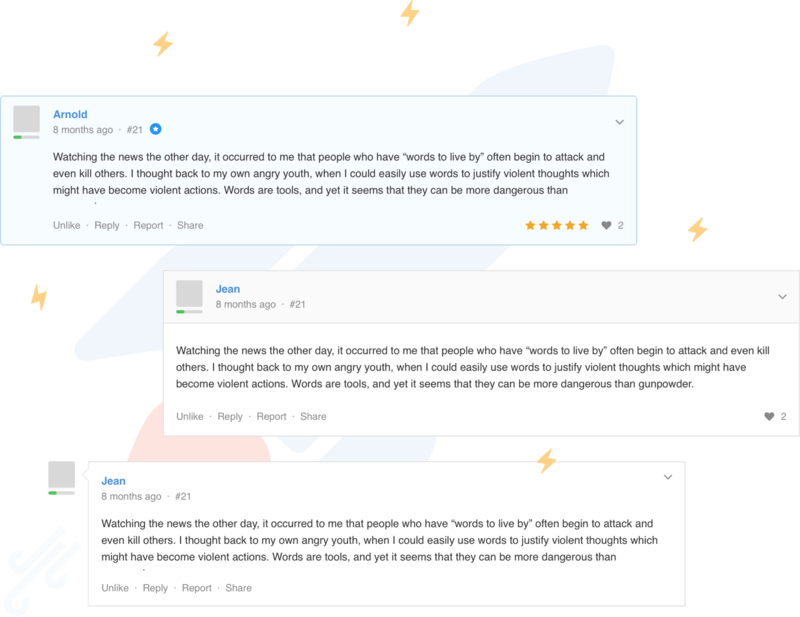 Migration Tools — Built-in migrators to move your old comments from other 3rd party comment extension into Komento within minutes. Insanely beautiful e-mails — Hassle-free and customizable e-mails to suit your needs at anytime with our built-in editor. Breaking the ice between audiences and authors with more than words! 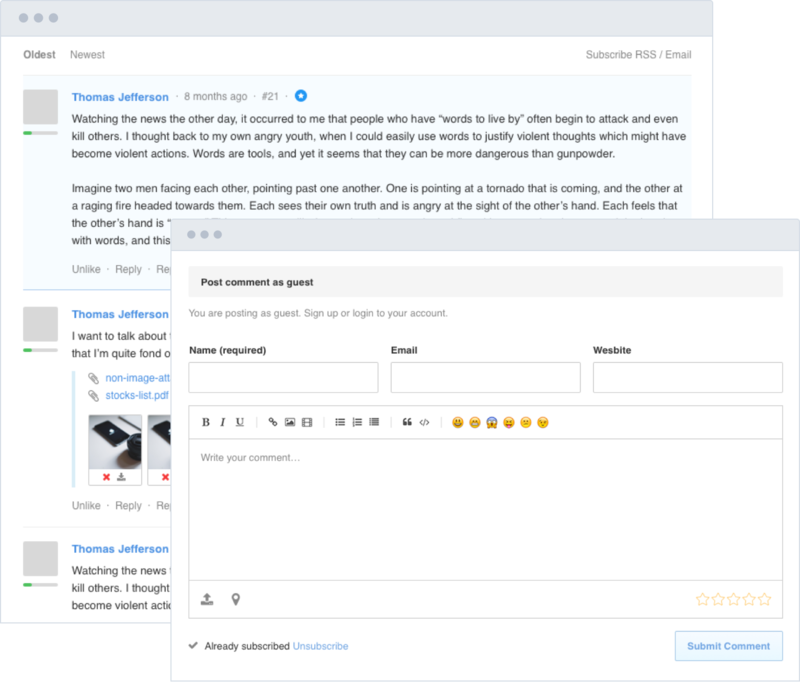 BBCode & Emotions — Users can personalized their comments to make theirs stand out by using BBcode and emoticons. Attachments — Include a file attachment to better illustrate your comments. There will also be thumbnails and lightbox previews when you attach images on any comments. Schema tags for SEO — With schema tags in Komento's HTML markup are compliant with Google's standard to achieve better SEO performance. It also means, comments can be fully recognized by search engines and easily found in search results. 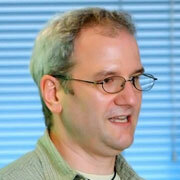 Delivering real time notifications to users' web browser out of the box. OneSignal integration — Users and visitors can get instant notification whenever a new comment is made on the site. Customizable notification — Site moderators are able to control the notifications content are being displayed on your site. Harness valuable feedback and information within your outreach. Geolocation support — Allows user to tag their own location as they leave a comment. Would it be interesting to find out where all of those comments came from? Social Sharing — Share comments on social media like Facebook, Twitter, LinkedIn, and more with just one click. No tedious configurations needed. Ratings — Authours can show a little gesture of appreciation by rating their audiences' comments. Let's spam proof your published content articles. 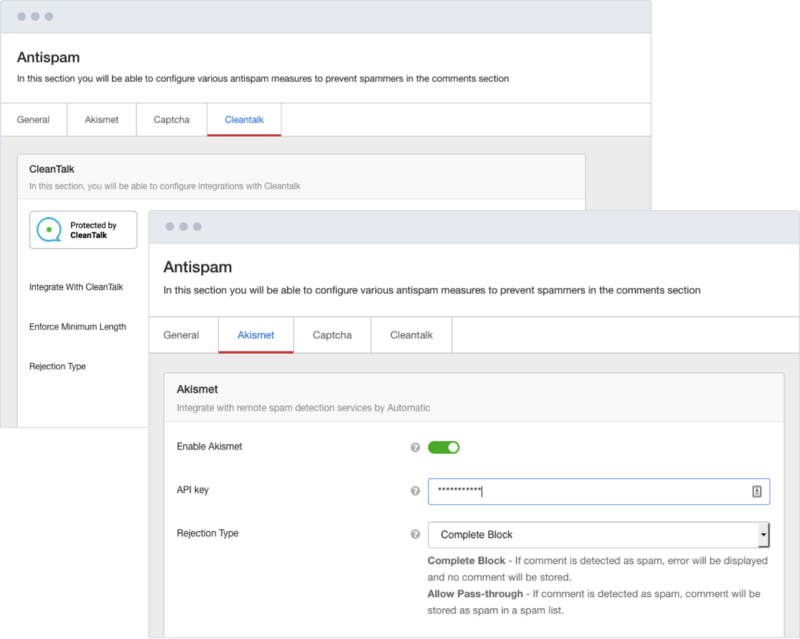 Spam Detection — Komento integrates with Akismet and Cleantalk for a more automated spam detection. Flood Control — Prevent spammers or bots from posting comments too quickly on the site. Advanced Control — Specify what users or user groups can do when commenting. You are in full control in managing user activities. Back-end Management — Simplified user layout for site moderators; a bird's-eye view on the vitals of their site for better and easier management. Step-by-step Installation — Seamless and straightforward installation. 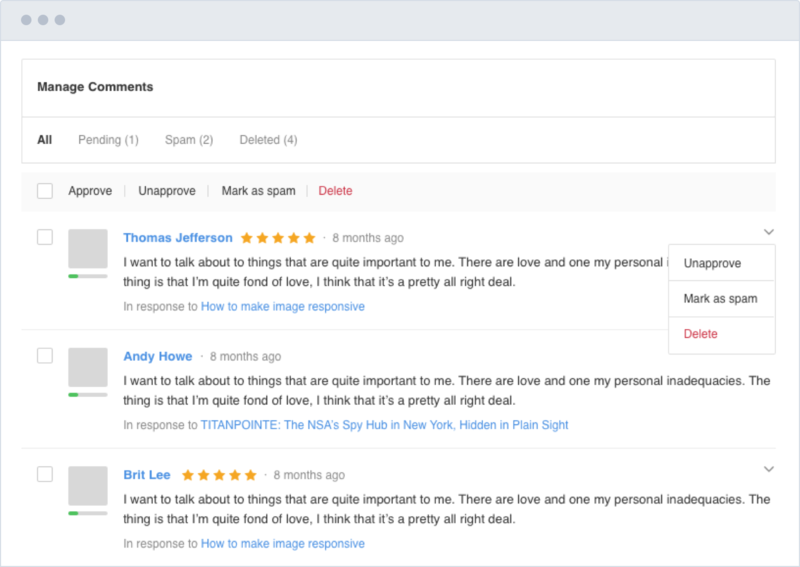 Have an amazing comment system installed on your Joomla on the fly! 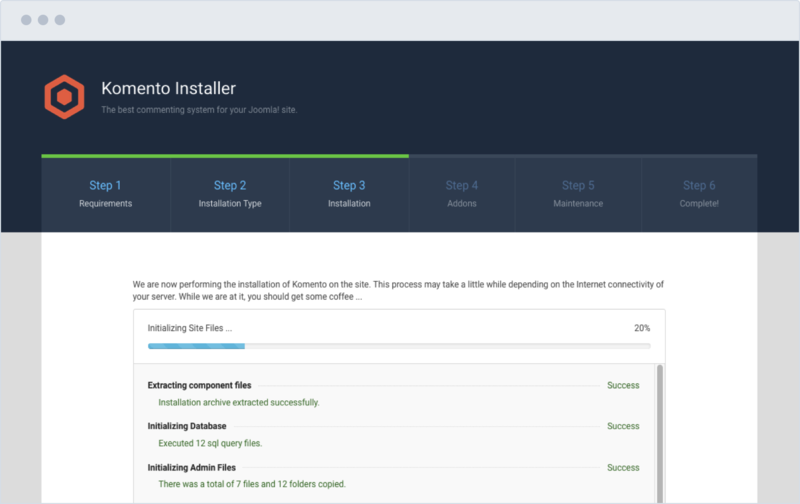 Adding a comment area in Joomla articles and content created in content construction kits (CCK) are supported by Komento. K2, FlexiContent, Zoo, Seblod, Cobalt 8 and JUNewsUltra Pro. Besides the built-in comment system found in EasyBlog, you can also choose Komento to manage user comments. Integrate Komento into catalog pages and allow shoppers to share their questions upon a particular product. VirtueMart, redSHOP, AceShop and MijoShop. Komento would also work with 3rd party event extensions in Joomla! You can add comment areas in online directories such as restaurant guide, members directory, FAQs and more. SobiPro, Mosets Tree and DOCman. You could even add comments on web pages with audio tracks, photo galleries, files directories and more. HWDMediaShare and FW Gallery (requires plugin). Komento can be activated to receive comments on propety listings. You will need a plugin to have Komento and FW Real Estate by FastW3b to operate. 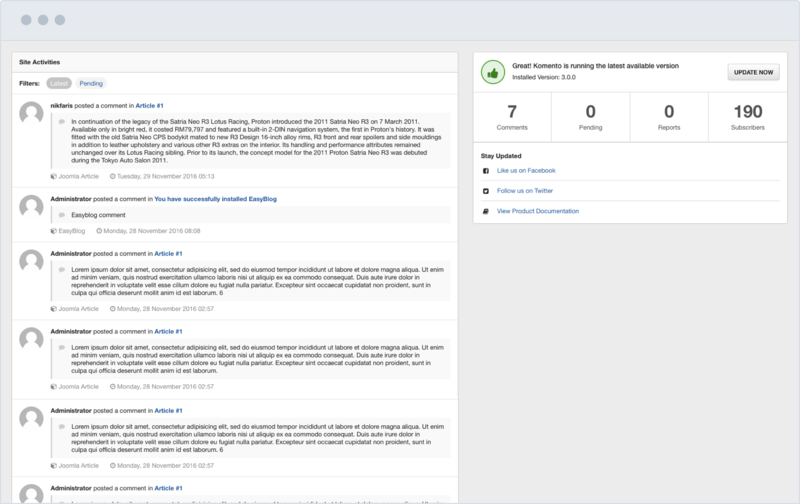 Displays comment items on profile pages or activity stream in any of your favorite social communities. 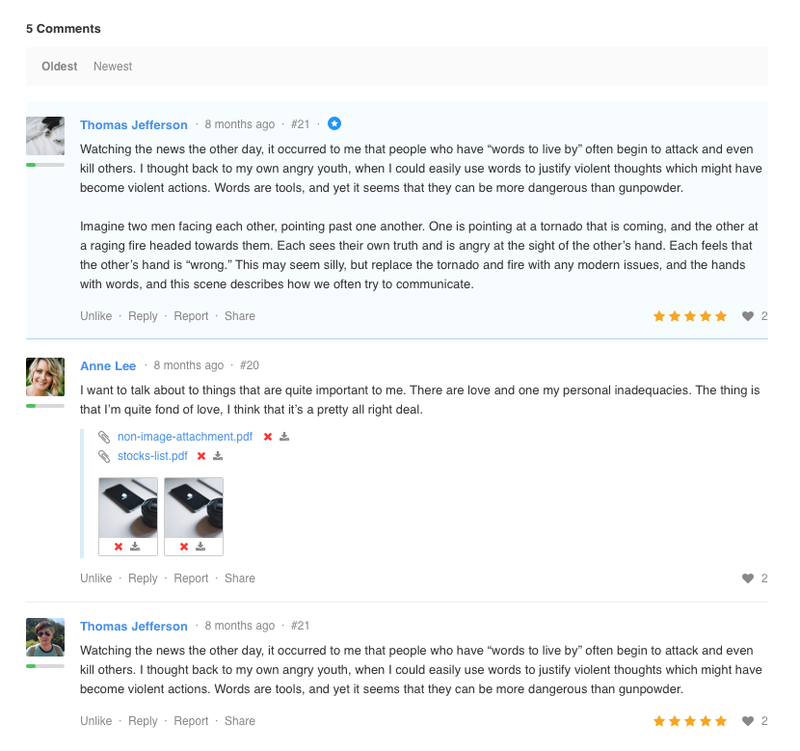 EasySocial, JomSocial, EasyDiscuss and Alpha User Points. Bring more life to your videos site powered by HWDMediaShare and Apptha Videos with comments. Viewers can express themselves via comments on their favourite videos. Komento gives you the freedom to engage with your communities.